What is the best power rack for home gym? Want to go hard and heavy even when you workout alone but afraid you'll crumble face first to the ground in your first rep of squats? Well, good thing, cause we did the leg work for ya (No pun intended) and came back with a list of 5 you should check out. But before we dive right into it, lets figure out what makes a good power rack, to begin with. Why Use A Power Rack? So What Is The Best Power Rack For Home Gym? Simply put, the power rack is your friendly neighborhood spotter. OK, OK, so maybe "neighborhood spotter" is not the best way to describe what is a power rack. That's better, because when you think about it, that's the core purpose of the power rack. Then again, there's so much more to it then just serving as your spotter. First of all, the power rack is a strong steel made piece of equipment. Which not helps make it a cheap piece of equipment I gotta say. Nevertheless, it still is, in many home, and commercial gyms, the cornerstone piece of fitness equipment. 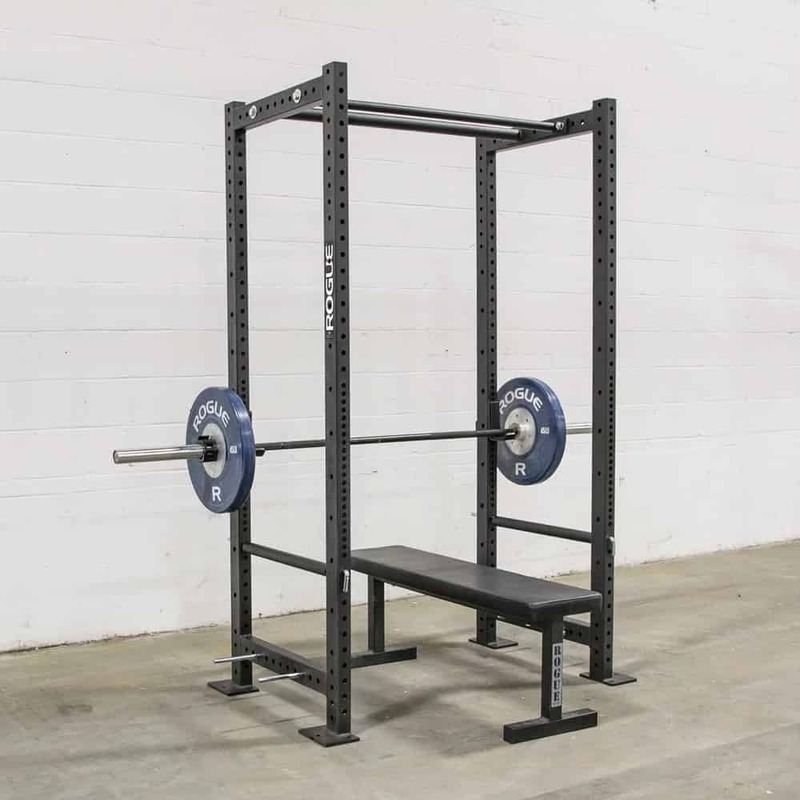 The power rack is a rectangle shaped cage, hence its other names, like power cage, or squat cage. Whatever you want to call it, it can serve you if you're into Olympic lifting, CrossFit, power lifting, or if you're just into building muscles and burning fat. In fact, I might go as far as saying that it can almost serve as a full home gym setup. With the help of a power rack you'll be able to do all sorts of exercise that you wouldn't do because you don't have a spotter that's got you covered in case you get stuck. But, more on that later. The power rack is a solid, strong, sturdy piece of equipment, that can serve as a multi function fitness equipment, all while also allowing you to push yourself to your limits, even when you workout alone. 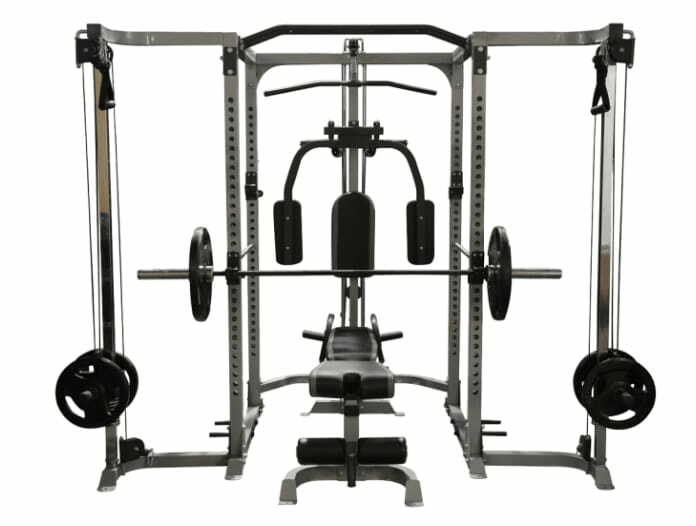 A power rack consists of four upright bars that are connected to each other, expect for on the front bottom. That's so that you could easily walk in and outside the rack without any trouble. The next thing you would notice are the holes that run (preferably) from bottom all the way to the top. These are the safety holes, and usually these holes also serve as a docking stations for various attachments, depending on the power rack. More importantly, you'll also use them to set the height of the J-Hooks, or J-Cups as some call them. The J-Hooks are what you put your weight bar on. Finally, we got the safety bars. These are two tube shaped long steel bars, that go inside the safety holes, and they act as your spotter. A power rack is a straight forward equipment, so that's pretty much it. There are several reason to why you should use a power rack. However, when we talk about the a power rack for a home gym, we would put the emphasis on two main aspects it should provide us, safety and versatility. First of all, I'll go ahead and say that when you workout at home, you probably workout alone. But, If working out for you means, you, an ab roller and a couple of 5 lbs dumbbells, you don't really need a power rack. 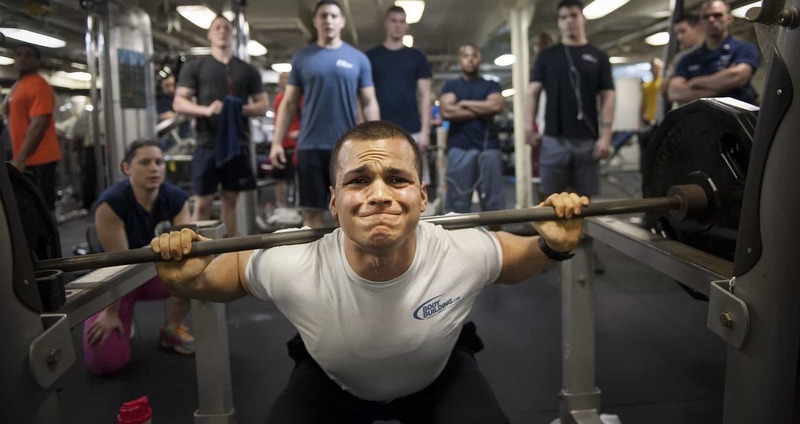 However, if you bench-press or squat alone, well, that's not really safe. But In fact, even if you were working out at a gym, it still wouldn't be that safe. This recent study found that 42% of gym injuries involve free weight exercises, followed by 3% caused by squats and deadlifts, and 2.5% from bench-pressing. And while 3 and 2.5% doesn't seem that much, an injury caused while squatting can be a serious injury. Now keep in mind, we're talking about ​a fitness equipment for your home. At least if something goes wrong in the gym, somebody ought to help you in some way, eventually. Who will help you when you're on your own? Furthermore, what if you're into getting your muscles to their failure point? How can you safely get them there if no one is spotting you? With its safety bars, the power rack acts as your friendly spotter. And while all power racks act as spotters, we're talking about one that will be right for you. Therefore, the most important thing you should check is the hole spacing for the safety bars. Ideally, all the holes should have the same diameter and run from bottom to top. And an ideal increment between the holes would be roughly around ½” to 1” max. 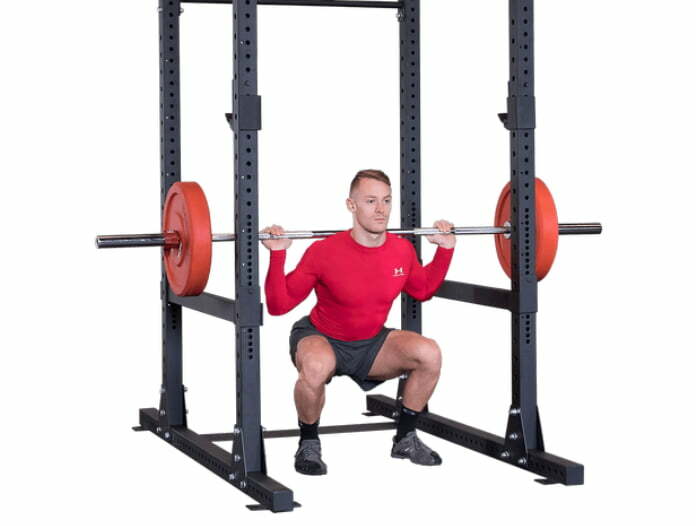 This will almost guarantee you will be able to fully customize the power rack to your body's size and needs, and also help you set an accurate position for the safety bars. So you'll be able to go hard and heavy without worrying about hurting yourself. Going after a power rack with a wide increment between holes might make it difficult for you to set the safety bars properly. So they'll either be too high, or too low. And if you can't set them up properly, when coming down you'll either bang the bar on the safety bars when they're too high. Or, if you'll get stuck, they won't be offering you any support because they're too low, and that's like not having safety bars at all. To sum it up, a good power rack is one that will eliminate the risk of you trapping yourself under a bar, or falling face first to the ground like a potato after 5 reps of squats. First of all, a power rack is an all around compound exercises equipment. And unlike dedicate equipment for a specific muscle group, (like a weight bench for the chest) a power rack can be your center for all sorts of exercises. Well, the 3 main exercises you can do inside a power rack (without a weight bench) are squats, deadlifts, and pretty much any type of bar curls. The first two are compound exercises. And If you add a weight bench, or if the power rack comes with one, well, that's another compound exercise you can do. But, in addition to these 3 compound exercises, there are plenty of other exercises you can do on a power rack. However, in most cases, this means you'll have to spend extra on attachments in order to get the max out of your power rack. That is, in case you can add attachments to it, and if you want to. And it's true that while you can't do every exercise in the book with a power rack, It sure can add the much needed versatility aspect to your workouts. While It's safe to assume that a power rack can be the center of your setup, If you feel that squats, deadlifts, and curls are enough for you, then by all means, stick with them. You can always add more equip or attachments to it, or around it, later on. Just make sure the rack you're interested in, has the option to add attachments. And it does't even have to be a massive upgrade or something like that. Even a simple upgrade like adding a second weight bar will allow you do supersets, and go super saiyan on the damn thing. Besides the two that I already mentioned above, safety and versatility, a power rack has a few more benefits to offer. So this one might sound funny, but they do actually save space. Got a weight bench? Great, put it inside the rack. You wan't to work your lats? Get a power rack with lat pulldown. You got one machine that can serve as a full gym setup. So despite their relatively large size, having one might mean you don't need to get a cable machine, a lat pulldown machine, squat rack, etc. Being an all in one gym setup, doesn't only means it can save you space. It also means you don't have to spend your money on other expensive fitness equipment like the ones mentioned above. Investing in a good power rack can save you a whole lot of money. Having one in your garage or basement will might actually help you keep a high motivation level over time. No need to drive to and from the gym after a hard day of work. No skipping workouts "just this one time" cause you're too tired. Furthermore, add to that the fact that it's so easy to use a power rack, and you get a piece of equipment that you'll enjoy using. Having a power rack allows you to workout alone whenever you want. A power rack basically acts as your spotter, making sure you won't get stuck under a barbell. Knowing this will help you concentrate more on the exercise you're doing and less worry about if you're gonna hurt yourself. Will It Fit In Your Home Gym? First you should measure the available floor space in your home gym. Make sure to add extra 20" in width and length when you do the measurements. This is to ensure the safe use of the power rack, and that the surrounding environment is somewhat far from the rack. Furthermore, this will make it easy to move around the rack to load and unload weight easily and fast. Next, you should think forward, would you still want to add any other equipment in the future? It's better to make these kind of plans now, then to realize later on you can't upgrade your home gym setup. Finally, measure your ceilings height as you don't want a taller rack than your ceiling, now do you? And make sure there's at least 5" space between the ceiling and the top of the rack. Most users don't want much from their power racks beside of what it's already capable of providing them. However, as I've explained earlier, the power rack can be the cornerstone of your setup and provide you a truly versatile workout. Saving you the trouble and money of purchasing other fitness equipment, and allowing you to really get a full body workout. But, in order to get the most of your rack you should look at its attachments. Keep in mind that this is totally up to you, your goals, and the level of workout you expect to get from your power rack. If squats and deadlifts are enough for you, then feel free to move along to the next point. Probably the most important thing you should consider is whether the rack is right for you, size wise. If you're really tall, you don't want a power rack that is 75" high. And if you're really short, maybe you shouldn't get a 90" high power rack. Make sure the holes for the safety bars run from the bottom of the rack all the way to the top. Make sure the rack has no more than 1.5" spacing between the safety holes, at least in the weight bench area. Finally, if you're using an Olympic bar, make sure the rack's width don't go over 49. That's because Olympic weights have about 52" between collars. If the power rack offers you the ability to perform dips, or pull-ups, you want to make sure it's got anchor holes to anchor it down to the floor. Most racks these days come with anchor holes, but you should keep an eye and confirm that the rack you want actually have them. Does It Have A Stabilizer? In case you can't anchor your power rack to the floor, you should check instead if it has stabilizer. As the name suggests, the job of the stabilizer is to add stability and balance to your power rack. A stabilizer is basically a bar that you add to the bottom of the rack's back. However, you'll want to make sure that the stabilizer is not that large, so it wouldn't be a problem if you decide to add a weight bench inside the rack. Is It Easy And Fast To Use? A power rack should provide you a safe workout. If you can't adjust the safety bars to a proper height that will support you in case you fail, then it's like not using a power rack. Next, you should check if it's easy to adjust the height of the safety bars, and you should take a look at the attachments. You want a power rack that has easy to add and remove attachments. Are they easy and fast to install? If not, keep on looking. When we workout we want to keep the flow going, wasting too much time on adding or removing attachment in the middle of the workout just isn't right. Finally, check how fast it is to set the rack up for an exercise. This is even more important if you're into supersets, since you need to keep the momentum high, and resting time low. Based on the above, we went ahead and did a little research of our own. We compared both popular, and not so popular brands that make power racks. After going over 50 models, which included comparing and reviewing them, we came to the conclusion that these 5 power racks would be a great addition to any home gym. So, without any further ado, let's start. The R-3 power rack from Rogue is probably the most famous one on our list. However, it's also the most expensive one. Rogue is known for making high-end fitness equipment, and the R-3 is no different. First of all, despite being a monster of a power rack, the R-3 comes in two height variations. 90" and 84", thus making it more suitable for low height ceiling rooms like your basement or garage. Its 1000 lbs weight limit means you can go hard and heavy, and it also means that if you're a beginner, there's a lot of room for you to progress with it. Furthermore, the R-3 features the Westside barbell hole spacing. At the weight bench area, the increment is 1" between holes, so you get a more accurate height position for the safety bars and the J-hooks. From mid to top, the increments jump to 2" between holes, which is enough for setting the J-hooks for squat. And while its 24" of inside depth is not the largest, it should be enough for most users, and it also helps to keep its size down. Two pull-up bars, one skinny and one fat will allow to spice up your pull-ups. Finally, there are more than enough attachments you can add to this power rack. Which brings me to its downside. You would expect that since it's already quite expensive, then Rogue would've included some free attachments with it. Meaning, you'll have to spend extra. The X-Class by Fitness Reality is our runner up in the best power rack for home gym category. And while I realize its price might be high for some, this rack got a lot to offer. First of all, it's a very solid and well built, it will back you up to 1,500 lbs of weight. Which is, and excuse me for saying, more than you need. But, its weight limit is not the best thing about it. The X-Class comes with dip-handles attachment included, and they're also adjustable in width. Which is great because it will allow you to go wide or narrow on your chest, shoulders and triceps. Furthermore, it comes with two sets of safety bars, one long and one short. In case you've mastered the proper form of squatting, you can use the short safety bars and squat outside the rack. Thus giving yourself a lot more room, in case you need it, for your squats. This power rack also has two pull-up bars, and you can set in two different height positions. But, changing the height is not that fast, or easy, since it involves bolts. Another something note worthy is that this rack comes with a stabilizer. So no need to pay extra for one, though I would still recommend on anchoring it to the floor. The major thing holding this rack back is the 2" increment between holes. Which might make it hard getting a precise height setting for the safety bars/J-hooks. The Valor Fitness BD-7 is another interesting power rack to consider. The first thing you would notice is the lat pulldown attachment that it's got. In addition to your lats, It will also allow you to work on your biceps, triceps, and trapezius to say the least. So it might be safe to say that the lat pulldown attachment can add that much-needed aspect of versatility to your setup. But the lat attachment is not the only thing interesting about this power rack. The BD-7 also feature a low row station, which extends the impact of the lat pulldown, and will also allow you to work your abs and lower back muscles. Its safety bars can take up to 800 lbs of weight, and the bar holders can hold up to 500 and 650 lbs respectively. So, at least on paper, you can push yourself to the limit inside this power rack. Another noteworthy and quite helpful feature is the weight plate storage peg, and there's 4 of them to be precise. So you get to keep your plates nearby, which makes plate changing way faster. It's major downside are its safety holes, they do run from bottom to top, but they start at 17.5" and go only up to 68". General speaking, this makes the BD-7 not very suitable for really tall users. However, the increment is 1" between holes, so as long your fine within the range of 17.5 and 68", there shouldn't be a problem for you. 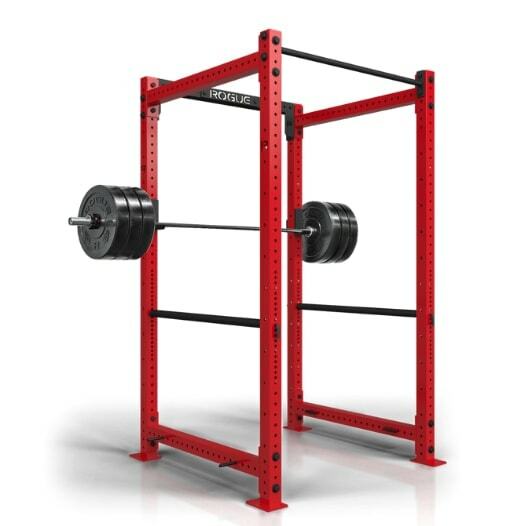 safety holes stats at 17.5" high and end at 68"
The Titan T-3 is what you would call a straight up power rack. No bells and whistles, no screwing around, just plain ol' power rack. Well, plain wouldn't be the right word to describe this one. Since you can "rack it up" all the way up to 1,100 lbs of weight, and you can store a total weight of 4,400 lbs. Like the Rogue R-3, the Titan T-3 features the westside barbell style, which means there's a 1" increment at the weight bench area. Which is great because it will allow you to position the J-hooks and the safety bars exactly where you need them. When we move up, the increment jumps to 2" between holes, which should be enough for setting the safety bars and the J hooks for squats. Another great thing is that this rack has safety holes from top to bottom, which means it will fit pretty much every user. The only downside involving the safety holes is that they're not numbered. It's got two pull-up bars, one skinny and one fat, and if you intend to use them, make sure you anchor the rack to the floor. Overall the Titan T-3 is a beast of a rack, and you can say it's a cheaper version of the Rogue R-3. However, you'll have to buy a stabilizer if you don't want to anchor it, and it doesn't come with any attachments what so ever. As I said at the beginning, this is a straight-up power rack. The PR-1000 by Rep Fitness wins the title of the best power rack for home gym when on budget. Being the most inexpensive power rack on this list you'll think it ain't got much to offer. But, that's not really the case. In addition to having a great price to value ratio, the PR-1000 can handle up to 1,000 lbs of weight. And, like the X-Class, this power rack also comes with dip-handles attachment. Unfortunately, the dip attachment is not width adjustable. But still, it's a nice addition to the rack, and definitely can come handy when you want to work your chest, shoulders, and triceps. Furthermore, the PR-1000 got more than enough variations, including a lat attachment, and a weight bench. So you can pretty much customize your setup as you please without breaking the bank. Another notable advantage you'd might appreciate is the height of the PR-1000. At 84" height, this power rack will fit in most low ceiling rooms, while also accommodating most users. Like most power racks, this one also comes with two pull-up bars. The safety holes run almost all the way from bottom to top, which is great. However, and this brings me to its major drawback, the increment between the safety holes is 2". If it had 1" increment, then this power rack would be a serious contender for the best overall title. The best power rack for home gym would have to be the Rogue R-3. First of all, the fact that it has two height variations make it suitable for even low ceiling rooms. And despite being a beast of a power rack, the footprint of the R-3 is not that big. Certainly when considering it's capabilities. Its 1,000 lbs weight limit might not be the highest limit on the market, but when you're doing bench-presses inside this rack, you can be sure the R-3 has your back. Furthermore, its westside barbell style means there's a 1" space between holes in the weight-bench area. 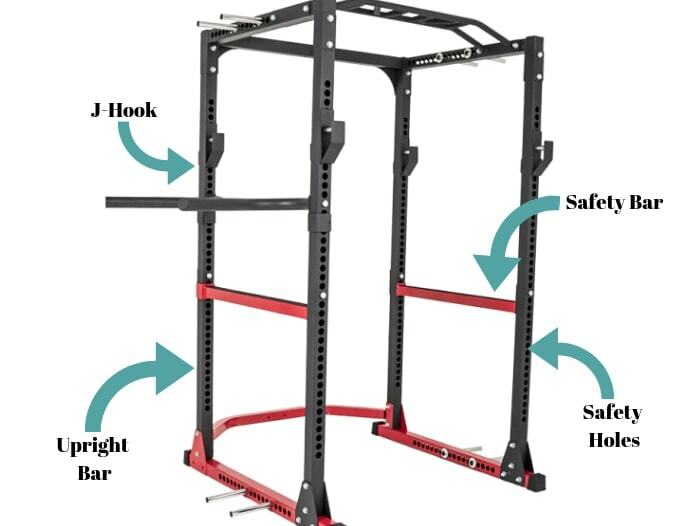 As a result you will have no trouble setting an exact height position of the J-hooks and safety bars. Making your workout session a lot more safer, which is the main purpose of having a power rack in the first place. Finally, there plenty of attachments you can add, but that's really up to you. So the Rogue R-3 is a compact power rack that doesn't take up much room, it's got 1" increment between the safety holes, high quality and very solid power rack. When you look for which power rack you should add to your home gym, I would say check out the Rogue R-3 first.